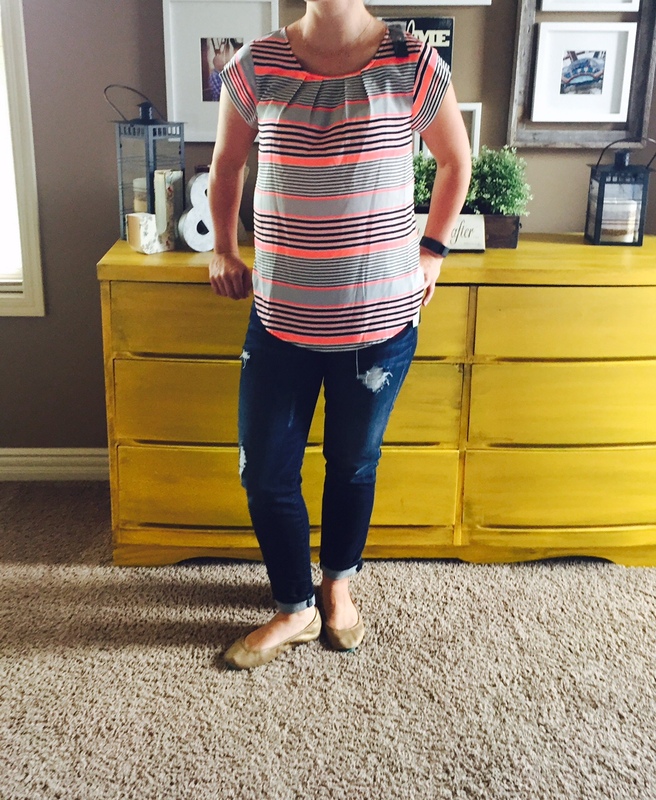 A few friends that I work with have been using Stitch Fix for a couple months now and I figured I would jump on board and try it out too. I mean, the pieces they were wearing were pretty darn cute, on trend & actually could go pretty easily from day to night---which is important since we all pretty much wear suits every day of our corporate life. So one day, I caved and typed in their URL. Up it popped and the rest is history. 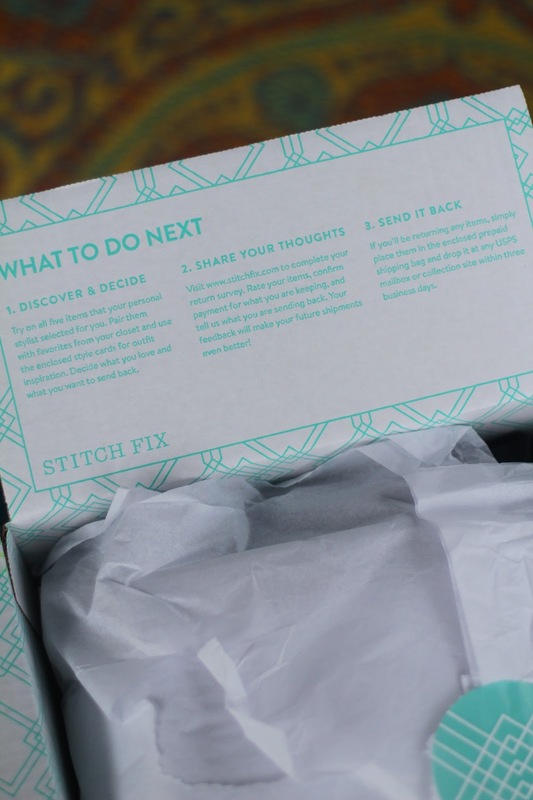 But first, what is Stitch Fix? Stitch Fix is basically like having your own stylist picking out clothes for you. You work your way through a few questions about various styles, saying what you like and what you don't like. 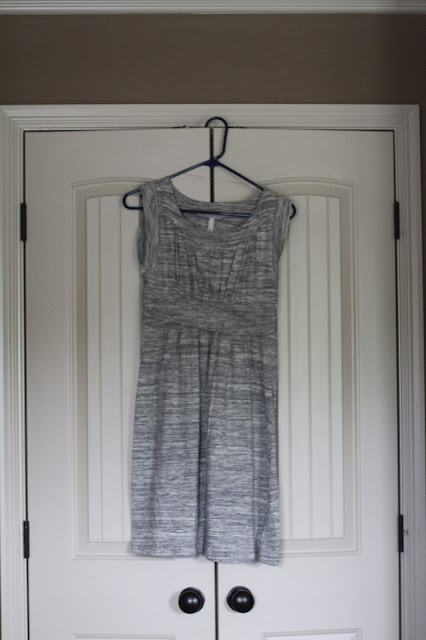 Choosing what type of clothing you tend to wear more often, what you want and don't want to see in your shipment & choosing price points on various items of clothing as well. & then I waited. & on Friday, July 17th, my first Stitch Fix box arrived. We were actually headed out of town & I wasn't going all the way home beforehand so I asked Justin to throw it in the car. I was going to wait until we got to my mom and dad's to open it but I just couldn't. 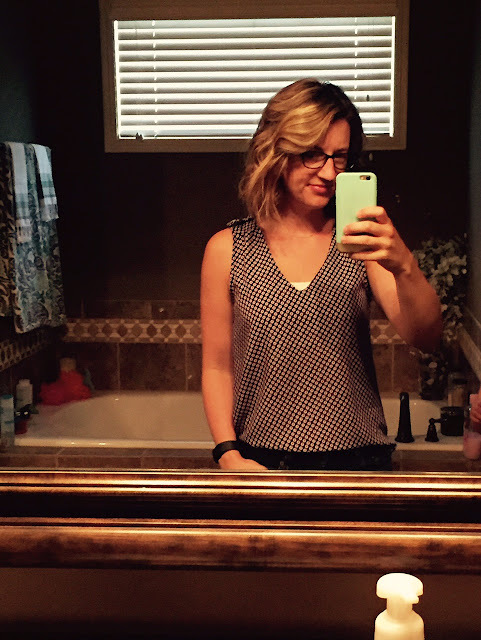 It was like Christmas and I was so curious to see what my stylist had picked out for me. The below pictures are a re-enactment. The other thing to keep in mind is that you receive a 25% discount on your order if you keep all 5 pieces. 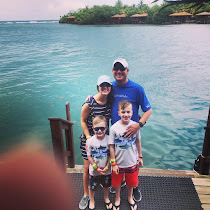 Oh and I don't like being in front of the camera--Kaden was my photographer and did the best he could with my iPhone but there are some things you just can't change--so no judgement! Danielle Long Knot Necklace--this necklace is long enough to wrap twice, maybe three times if you wanted it super short and weren't claustrophobic. A Toledo V-neck Blouse--not something that I would normally choose because I tend to go with black and white and little color but I tried it on, it fit well and I liked it with both jeans and suits/skirts. 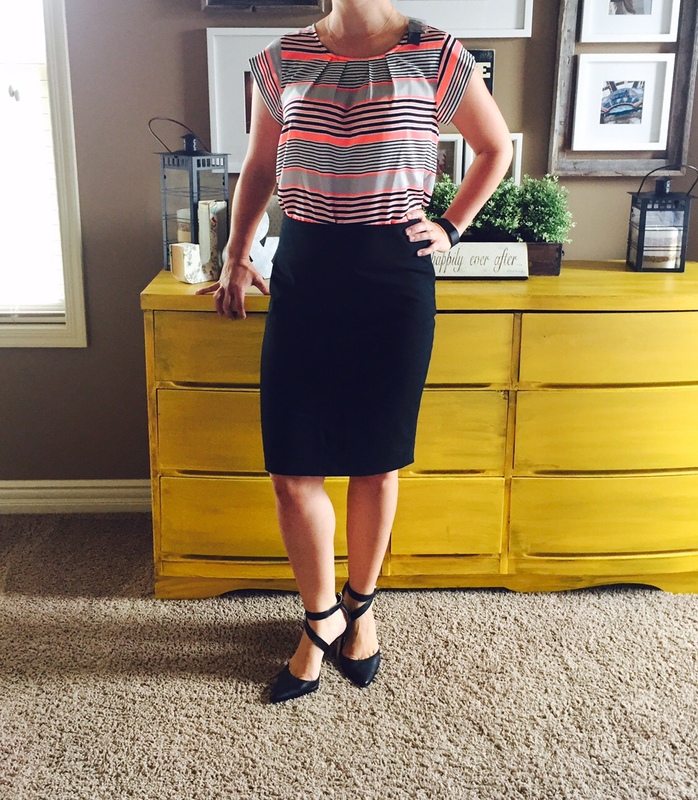 A Douglas Pleated Blouse--again, nothing I would normally choose for myself but again, it fit well and I really liked it under suits. 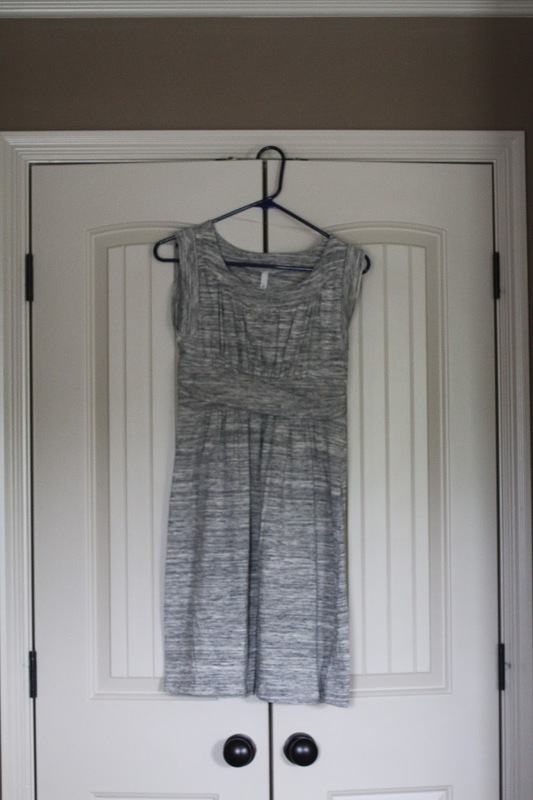 I wore it this past week with a black skirt and got so many compliments. 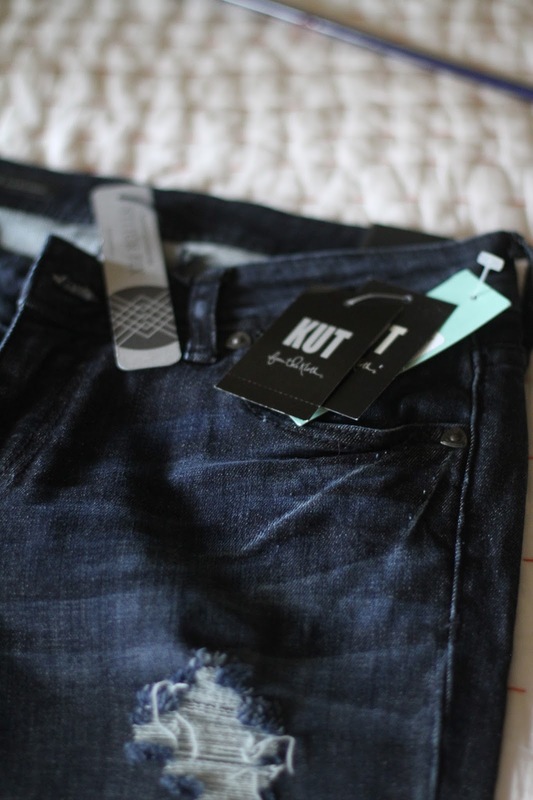 Aviva Boyfriend Jean-Kut from the Kloth--again, these jeans fit really well. I have a very hard time finding jeans that fit because I am a little on the short side---shocker, I know. However, these fit around the waist and in length. 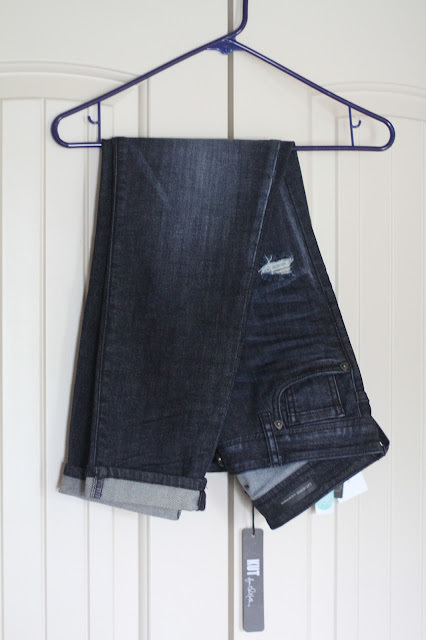 They will make great date night or everyday wearing jeans but unfortunately, I can't wear them to work because they're a little distressed---then again, I can only wear jeans on Fridays so not a big deal at the end of the day. 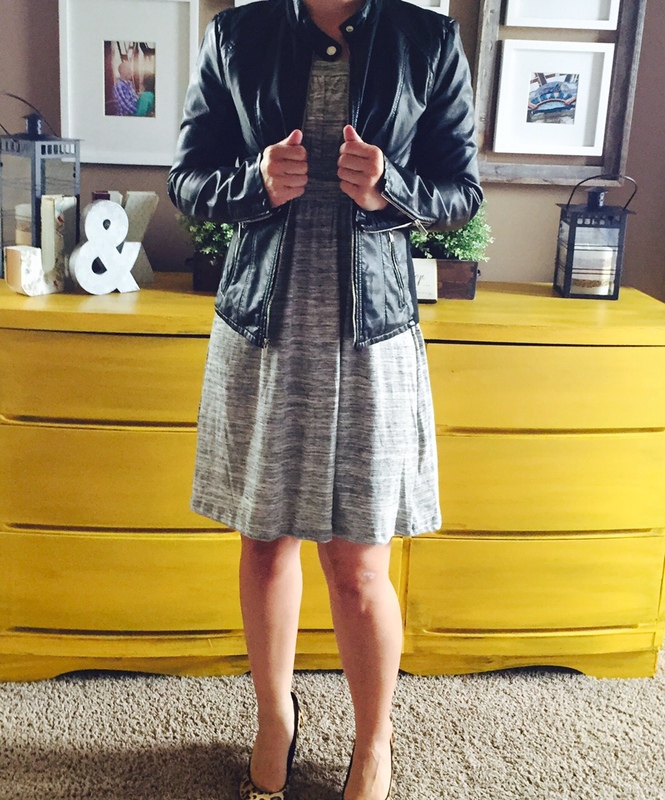 Camile Jersey Ruched Detail Dress--this was probably my least favorite piece out of the box. I liked the shape, it fit well but I was still having a hard time figuring out how to incorporate pieces that I already had in my closet with it. Honestly, I have pretty much exactly what "my" stylist suggested in the pictures she sent. I just didn't think I could pull it off but I will totally wear this with my jean jacket and flips. With each Stitch Fix delivery comes a pre-paid return shipping bag. You try on the clothes, you decided what you would like to keep and what you don't and that is that. Well kind of. For this particular box I would have kept 4 out of the 5 pieces, returning the knit dress. However, the 25% discount that I would receive if I kept all 5 pieces was greater than the dress itself, so it didn't make sense to send anything back. I'll find a way to work it into my wardrobe, one way or another. After deciding to keep all items, I logged back into my account on their website and reviewed each piece. By providing feedback, my stylist will know what I liked about each piece and what I didn't and will be able to keep that in mind for next month's shipment. And I should note that you can sign up for monthly boxes, every other month boxes & have the ability to delay shipments too. 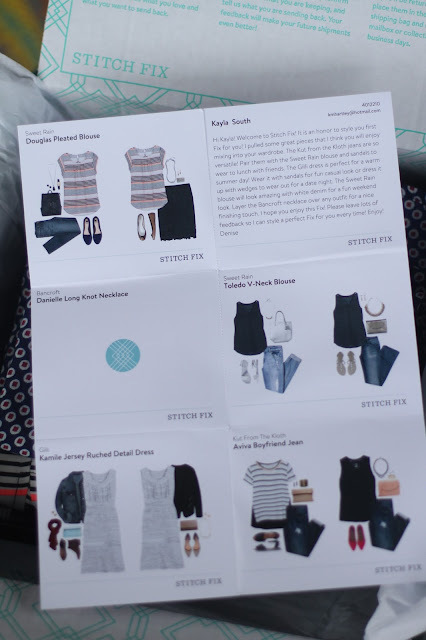 And if you are on Pinterest, you can actually link your Pinterest Board to your Stitch Fix account and your stylist will take into account the items that you pin and try and either find some of those items or similar items for you. How cool is that!?! ?